WASHINGTON, DC, December 9, 2011 (ENS) – Marijuana cultivation sites on 67 national forests in 20 states are damaging to public lands, warns U.S. Forest Service director of law enforcement, David Ferrell. “The illegal cultivation of marijuana on our National Forest System is a clear and present danger to the public and the environment,” Ferrell testified Wednesday before the Senate Caucus on International Narcotics Control. “Many marijuana sites found on national forests are under cultivation by drug trafficking organizations that are sophisticated and include armed guards, counter-surveillance methods, logistics support and state-of-the-art growing practices,” Ferrell said. “It is incumbent on the agency to do what is necessary to ensure that the resources we manage are protected and visitors as well as employees are safe,” he said. Ferrell gave an example from Forest Service efforts in California, where the cleanup and restoration of 335 sites resulted in the removal of more than 130 tons of trash, 300 pounds of pesticides, five tons of fertilizer and nearly 260 miles of irrigation piping. Native vegetation is cleared before planting the marijuana. Ferrell told the lawmakers that pot cultivation diverts water needed elsewhere. An average size marijuana plot of approximately 1,000 plants requires up to 5,000 gallons of water daily. Miles of black tubing transport large volumes of water diverted from streams, lakes, and public drinking water supplies. Natural vegetation and wildlife are killed as growers use “liberal doses of herbicides, rodenticides and pesticides, some of them banned in the U.S,” Ferrell said. These chemicals can cause extensive and long-term damage to ecosystems. Human waste and trash in the grow sites are widespread. Winter rains create soil erosion and wash the poisons, waste and trash into streams and rivers, including Congressionally-designated Wild and Scenic Rivers and National Recreation Areas, Ferrell said. Costs of cleanup and restoration are cutting into limited agency funds, Ferrell told the caucus members. 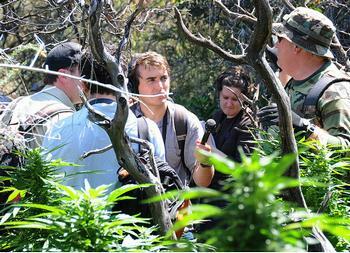 The typical marijuana site covers between 10-20 acres, he said. It costs about $5,000 an acre to clean up a grow site. The restoration of the site to re-establish streams costs another $5,000 an acre. And yet another $5,000 an acre is needed to restore the area to its natural state. So the cleanup and restoration costs amount to between $150,000 and $300,000 per acre, Ferrell estimated. For instance, more than 25 officials and government agency representatives were airlifted into an illegal marijuana grow site in the Mendocino National Forest on July 29, 2011 during Operation Full Court Press. This focused operation involved the California National Guard Joint Task Force Domestic Support – Counterdrug and more than 20 federal, state and local partners whose mission was to identify and eradicate marijuana on public lands while reclaiming those same lands in Lake, Mendocino, Colusa, Glenn, Tehama and Trinity counties. Ferrell told the panel said the Forest Service will continue to enhance partnerships with other federal, state, local and Tribal agencies in a cooperative effort to investigate and eradicate marijuana cultivation and other narcotic activities on National Forest System lands.